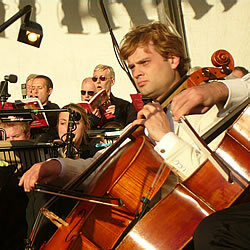 A popular form of classical music concert in the UK is known as a prom. 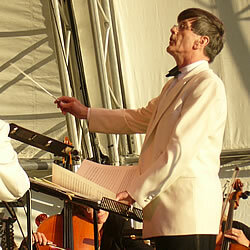 The best-known proms are the BBC Proms in the Royal Albert Hall in London, a tradition which started in 1895. There is a series of concerts over about two months, with the final concert in mid-September being known as The Last Night of the Proms. The final half an hour features a collection of traditional British favourites, and the audience enjoys a party atmosphere and wave flags. 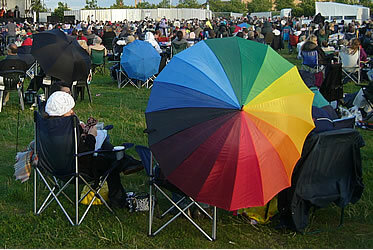 Since 1996 on the last night there are also BBC Proms in the Park concerts in various parks across the UK on the same night as the Last Night of the Proms concert in the Royal Albert Hall. 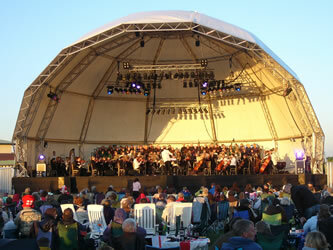 In recent years a number of other organisations have also created proms events. 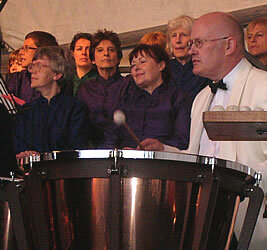 Most of these concerts are in the summer months, usually on Saturday evening, and take place in parks or in the gardens of castles or country houses. 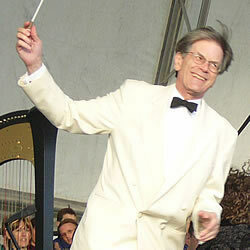 Proms may also be performed in concert halls at any time of the year. 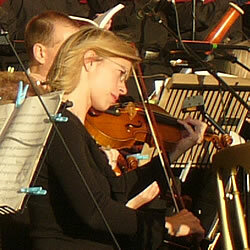 The pictures below were taken at the 2008 Proms in the Park on Saturday 20th July 2008 in Campbell Park, Milton Keynes. This event was organised by Eastern Breeze. Proms concerts are often in the evening during the weekend. Typically the garden or park will be open to ticketholders at about 6pm, giving people time to find a place and perhaps to have a picnic. The first half of the concert might be from 8-9pm, the interval might last for 30 minutes, and the second half of the concert might be from 9:30-10:30pm. If it is important for your plans, check the approximate timings with the organiser. If you are going by public transport you should plan carefully how to get there (country parks are not usually well-served by buses) and in particular how to get home afterwards (late-night buses are usually only available in cities). Saturday night is a busy time for taxis, so it may be wise to pre-book one and to agree exactly where it can pick you up (avoiding areas which will be busy with cars leaving). Since several thousand people usually attend proms concerts, so if you drive there you can expect some delays getting away from the car park afterwards. If you are going to an outdoor prom it is wise to check the weather forecast before you go. It may be cold by 10pm, even if it is the middle of summer and if the daytime has been warm, so think about taking a coat, scarf, gloves and blanket. A thermos of hot tea or coffee may keep you warm, or you can buy some hot food or drinks at the venue. An umbrella or waterproof coat will keep you dry if it rains, and may help to shelter you from wind. If you plan to sit on the ground take a waterproof rug, in case the grass is wet. 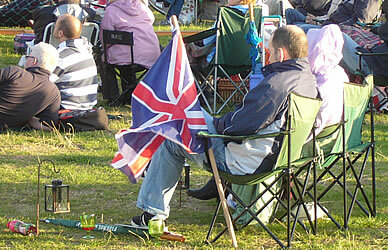 If you are travelling to the concert by car you might take a folding chair and table (check first if this is allowed - there may be limits on space). Tables and chairs are available for hire at some events (you may wish to hire these in advance because the number of items available will be limited) - as well as the hire charge a deposit will need to be paid which you will get back when you return them at the end of the concert. 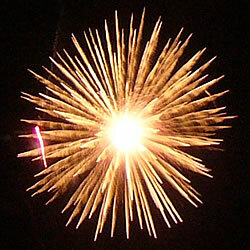 It will be dark when you leave, so a torch could be useful (do not take candles because these could cause a fire). 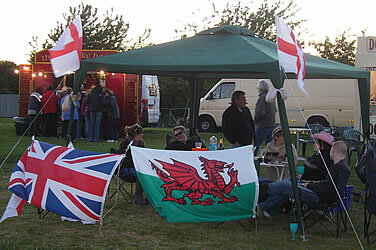 Take a flag if you wish - the usual choices are the English, Welsh, Scottish or British flags (some of these will probably be on sale at the venue). 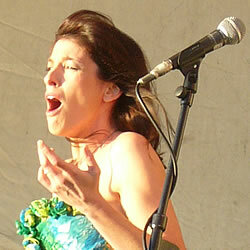 A portable stage is set up in the garden or park. Speakers are set up to make sure that everyone can hear the performances. The stage is lit up after dark. 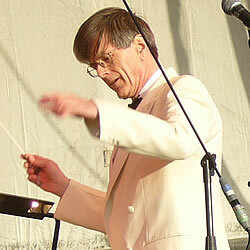 The conductor not only leads the orchestra but also introduces the different works, often in a witty and amusing manner. 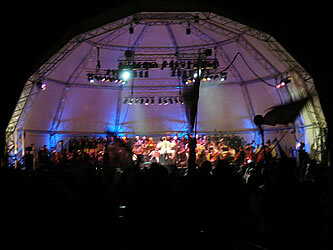 A full orchestra performs on the stage. 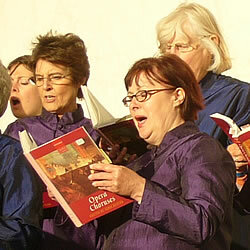 There is usually a choir. 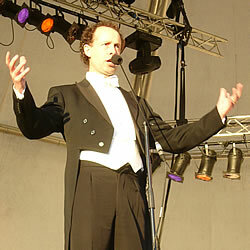 Often a tenor and soprano perform operatic classics such as Puccini's Nessun dorma or Time to say goodbye. Rule Britania! Britannia rules the waves. Bring me my spears o'clouds unfold! The proms always end with excited waving of flags, and outdoor events may end with fireworks or sometimes the firing of cannons (especially for Tchaikovsky's 1812 Overture).